Elegant, Innovative, highly durable and easy to clean Luxury Vinyl Flooring. Amtico exceeds expectations, using all the latest technology to bring cutting edge floor designs to your home. 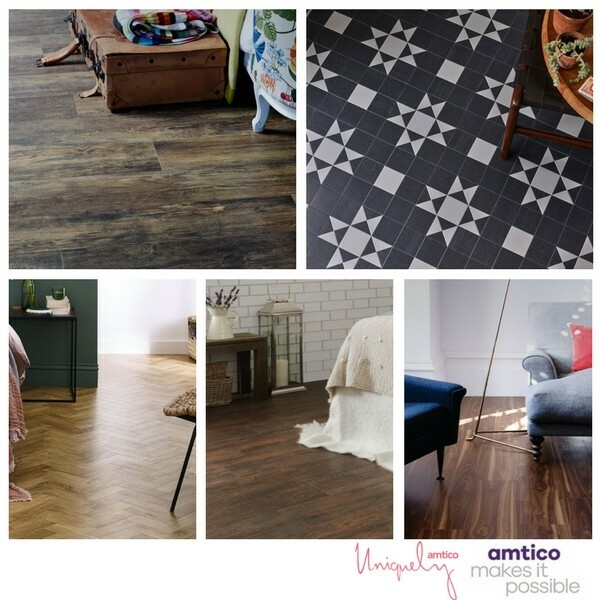 The Amtico Signature Collection allows you to explore inspirational choice and endless possibilities in Wood, Stone or Abstract palettes and add charm and character with your choice of laying pattern such as herringbone, parquet, basket weave and checker board. Amtico Décor is a premium flooring collection that combines the elegant and timeless Victorian style with the durable and long-lasting benefits of the premium Signature range. The original designs in this timeless collection are created from individually cut and bevelled pieces to ensure a stunning, high-quality finish in a mix of traditional and contemporary styles. Amtico Form is an enduring collection that perfectly suits modern and traditional spaces alike. Choose from textured hand-crafted woods or cool and contemporary stones in from elegant range. Bring style and creative flair into your home with Amtico Spacia, a collection at the forefront of craftsmanship and interior fashion. This classic, pre-designed range offers a mix of styles that will beautifully complement the way you live. Amtico Click Smart is a versatile and practical rigid click vinyl collection that makes no compromise on style and quality. As the name suggests, this range requires no adhesive and simply clicks together reducing installation time and costs for you the customer. Call into either of the Bramley Carpets Showrooms to discuss options and browse the Amtico collections.